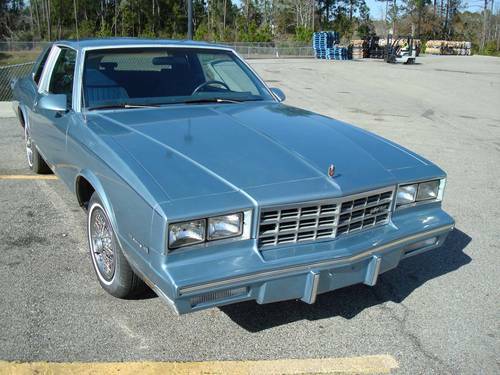 1986 was an interesting year for the Monte Carlo because there were four separate body styles to choose from. The base model Sport Coupe was still available as the base model although this would mark its last year. It did feature new “aero” side mirrors similar to Corvettes. All 1986 models received a redesigned dash featuring the new Delco electronic radios and new gauge graphics. Brand new for 1986 was the LS Luxury Sport model that had a European style front fascia, “aero” side mirrors, and a more modern looking rear fascia. This model features composite “Euro” headlights instead of the four headlights on base models. The rear bumper lost the notch between the bumper and the trunk and the taillights wrapped around and were visible from the sides of the car. The SS model went virtually unchanged except that it too went with the newer “Aero” mirrors. Introduced for the first time in 1986 was the Aerocoupe which was created by modifying the body on the SS model. It included a deeply sloped rear window with a shorter trunk lid. The spoiler was also flatter than previous SS models. 200 Aerocoupes were sold to the general public which was the exact number that NASCAR required so that road model car features could be incorporated into a race car. These Aerocoupes have since become highly collectible.